The last few weekends have seen five Regional level teams participate in the Miyagi Prefectural Winter League competition, with something of a surprise result. 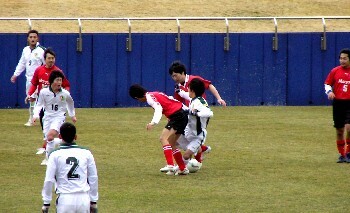 NEC Tokin and Wiese Shiogama play their regular football in Division 1 of the Tohoku League and indeed NEC had a reasonably successful season in 2006, finishing third behind TDK and Grulla Morioka. 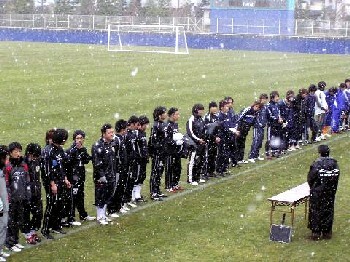 The other three sides - in what is essentially a competition for the top clubs in suburban Sendai - were Tohoku League Division 2 (South) clubs Marysol Matsushima, Shichigahama SC and Nakaniida Club, the latter having been promoted from the Miyagi Prefectural League at the end of 2006. Marysol, on the other hand, are an experienced Regional team and last year just missed out on a Promotion Play-off spot, having run Furukawa Battery close all year long. The format of the Winter League is a straightforward round-robin group, with every team playing every other team once over five consecutive weekends at a single neutral venue. It was Marysol who got off to a flying start in the opening game on 14 January, claiming a 3-2 win over favourites NEC Tokin - in the other match, Shichigahama pegged Wiese Shiogama back to a 2-2 draw despite having been two down at half time. NEC bounced back into contention with a pair of victories in the following two matches, which included an 8-2 thrashing of Shichigahama, but Marysol plugged away and kept scoring narrow wins. At the other end of the table, Nakaniida struggled and one wonders how they might perform in the coming Tohoku League season, as they emerged without a single point from any of their four games. In the end, it was Division 2 side Marysol who triumphed in the tournament, as they overcame a disappointing Wiese Shiogama 2-1 in the final round of fixtures on 11 February to complete a record of twelve points out of a possible twelve.